The Delray Beach Tennis Patrons Community Tennis Association hosted its first United States Tennis Association Recreational Coaches Workshop on June 25 at the Delray Beach Tennis Center. Led by USTA national trainer Butch Staples, high school students taught the local program along with Arthur Ashe Middle School's new National Junior Tennis League leaders. 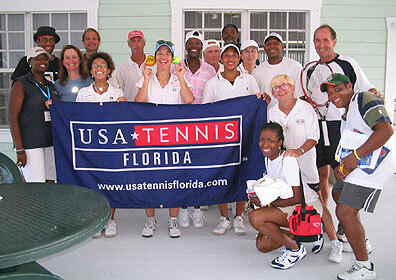 Cheryl Rivera of USA Tennis Florida, local coaches, teachers, organizational staff and park and recreation department staff devoted their time to make this workshop a success. The City of Lauderhill and the City of Ft. Lauderdale were among the organizations that made possible this day of fun learning! Administrative Manager for the City of Lauderhill Daphne Brown, M.S., CPRP, returned for this workshop after a 10-year hiatus. Brown is now offering free and low-cost lessons at local parks and recreation facilities. If you are interested in attending a future Recreational Coaches Workshop, please visit our Workshops Web page to find the workshop scheduled nearest you.